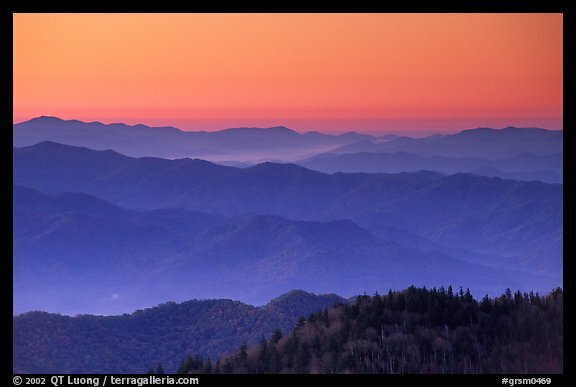 The Appalachians, largest mountain range in the Eastern US, culminates at its southern end in North Carolina and Tennessee. Those two states split Great Smoky Mountains National Park, which preserves one of the finest virgin deciduous forest in the world. 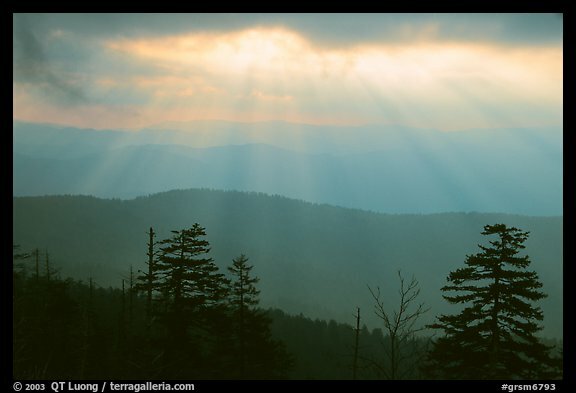 The top of Clingsman’s Dome is the highest point in the Park, at 6,643 ft (2,025 m). The only (slightly) taller mountain East of the Mississippi is Mount Mitchell 6,684 ft (2,037 m), northeast of Ashville, NC. 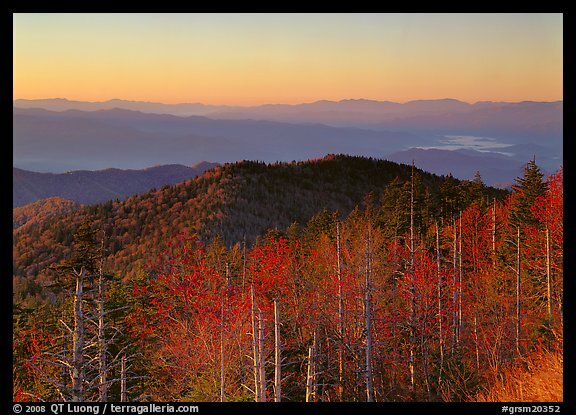 Clingman’s Dome is extremely easy to access, as a 7-mile spur road, branching from the Newfound Gap Road, leads to a large parking lot near the top, from which the best photography spots are found. 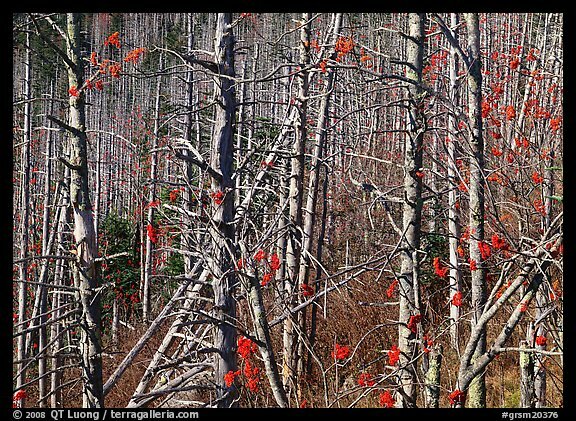 From the peak, located almost at the center of the park, I found large gaps between trees – just at the edge of the parking lot – that framed great views over forested ridges, extending to the horizon. The Great Smokies were named for the fog that often hangs over the range. This fog is the result of warm humid air from the Gulf of Mexico cooling rapidly in the higher elevations of Southern Appalachia. It made the views more special by allowing me to create compositions with layers of ridges fading in the distance. Their progressively lighter tones provides the strong three-dimensional clue named “aerial perspective”, first used in paintings from the Netherlands in the 15th century, and then in the Mona Lisa. The light is fine both at sunrise and sunset. At sunrise, I prefer to set-up the camera at the east end of the parking lot, while I find the west end preferable for sunset. I walked once to the top of observation tower, through a half-mile paved trail, but the view from the rounded summit wasn’t as interesting, that is unless one is interested in surveying dead trees. Fog is more likely to be found in the morning. I set up my alarm one hour and half before sunrise. It took more than half an hour to drive there from the campground (same as from Gatlinburg). In the spring and fall, the temperature on the top often drops below freezing at night. I noticed icicles forming where streams drop onto the road Clingman’s Dome road. Arriving at the top 40 minutes before sunrise, as I stepped out of the car, I was greeted by temperatures much colder than at the campground. However, there was no temptation to retreat into the car, as an intense orange glow lit the eastern horizon, contrasting with the blue ridges. Since those ridges were backlit and quite darker than the sky, I used a graduated neutral filter to keep the contrast in check. After the sun came and illuminated the entire landscape, I switched to a wider lens, including foreground trees into my compositions. Although the sun got higher in the sky, I was still shivering from standing for a prolonged time in the cold, although by the time I drove down, the icicles had started to collapse. Great Smoky Mountains it the most visited of all National Parks, so summer crowds can jam the roads, although it is usually pretty quiet before sunrise. Spring sees less visitation and a variety of blooms. With all this variety of deciduous trees, autumn offers a spectacular sea of colors which in general peak at mid-October at the higher elevations. However, I prefer to photograph the colors from the Newfound Gap road, where closer trees in fall foliage provide a more harmonious foreground. The Clingsman’s Dome road is closed in winter and doesn’t re-open until April. Posted on July 15, 2010, 1:21 am, by QT Luong, under National Parks Photo Spots.